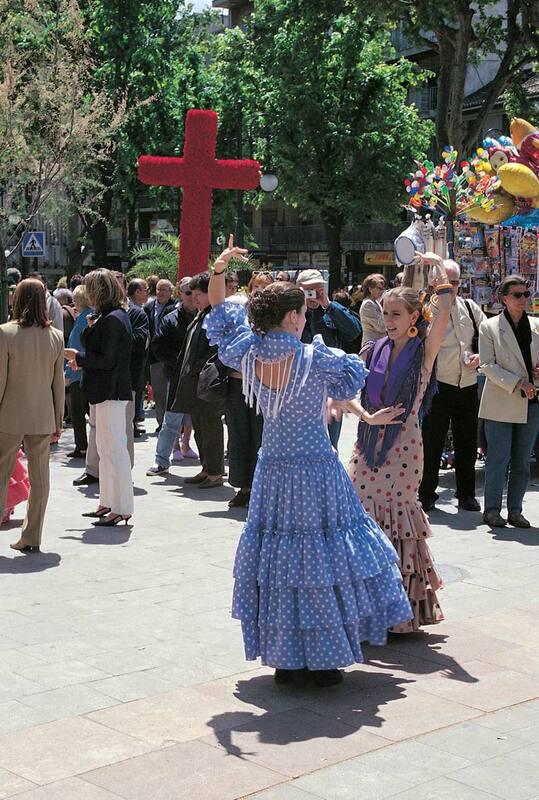 On the 3rd of May Granada will be celebrating the “fiesta de las Cruces” a festival that is emblematic of the city. A date filled with tradition and charm. The fiesta of the cruces stems from the XVII century and takes its current configuration from the early years of the 20th century. It brings a festival in which each barrio or neighbourhood organises to erect in the street a large cross ornately adorned with flowers and precious metalwork. There are various elements that are compulsory for a Cruz de Mayo. On one side there is the “Chavico”. It is tradition that the children use the base of the cross as a donation box or dropping well. The word “Chavico” comes from the term “Ochavo” which was a small coin in circulation in the early 1900’s. The “pero” and the scissors are two of the elements that are also essential at the foot of any cross. The “pero” (looks something like an apple or pear) is placed so that nobody can add a “pero” (complaint or criticism) to the cross. That is to say, one is forbidden to criticise the Cruz de Mayo and the “pero” reminds of this. The scissors clamping the “pero”, are for nothing less, than cutting the tongue from a critical mouth. The music and the dance are also a key part to the fiesta. Much of the music comes from Andalusian folklore, with sevillanas (flamenco ballads) commonly heard. As the day progresses and the crosses are illuminated, even the shyest begin to dance. The fino (a dry sherry) that is enjoyed at the surrounding bars can help to overcome any pre dance nerves. A large number of the Crosses are accompanied by their own bar where food and drink is served. The ever present “salaillas” (savoury pastries) and las habas (Broad beans) are the snacks of choice. The followers of Andalusian folklore will have prepared their finest gypsy outfits for the celebration of the cruces. The more traditional the cross, the more traditional the sartorial pride. Not all of the crosses are of the rustic variety, there are a number that celebrate in a more modern style and there is music and atmosphere to suit all tastes. On the 3rd of May, remember to hit the streets and see the crosses, enjoy the atmosphere and enjoy a vinito. The most daring might want to get up and have a dance, even try keep to the rhythm of a lively sevillana, it does not matter if you are not the finest dancer and don’t know the steps, there are sure to be plenty of willing volunteers to show you the way.